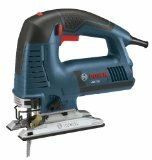 This jig saw from Bosch is designed to excel in every way. It is not cheap, but then quality rarely is. The motor has a powerful 7.2 amp rating, yet vibration is kept to a minimum with an excellent counterbalancing system. There are four settings which affect blade stroke depending on the material being cut. With LED-lit guidance and a unique double roller system holding the blade in place, a very high level of precision is attainable with the JS572EL. Ergonomic design along with fine control of speed make this jig saw a pleasure to use, while the adjustable dust blower keeps the point of cutting free of debris. Built to professional and industrial standards, the JS572EL has a cast magnesium footplate and is well able to take the inevitable knocks it will encounter in a typical work site. Even the case is a design innovation: the L-BOXX system allows several tools packaged in their own boxes to stack or even to latch together. Amazon has a full user report written by one of its top reviewers, Victor Agresti, in which he describes this Bosch as an engineering marvel and "the very best jigsaw on the market".